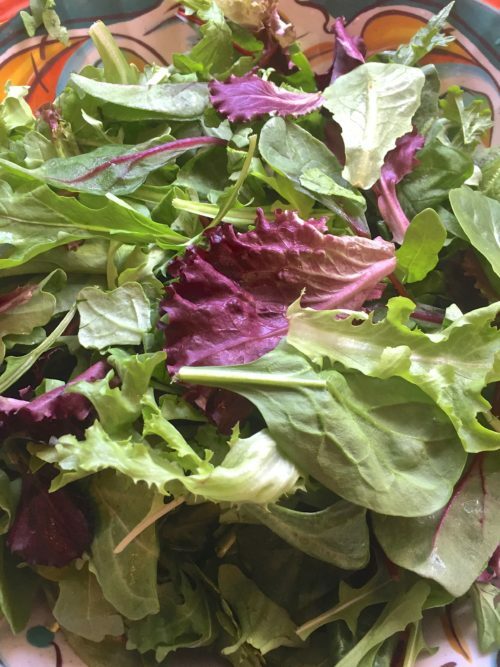 So Thanksgiving is over, that doesn’t mean you still can’t make this salad. Didn’t Thanksgiving come and go in a wink of the eye? And all those little grandsons have gone home. I had so many pumpkin things I wanted to share this year that I couldn’t fit them in before Thanksgiving. 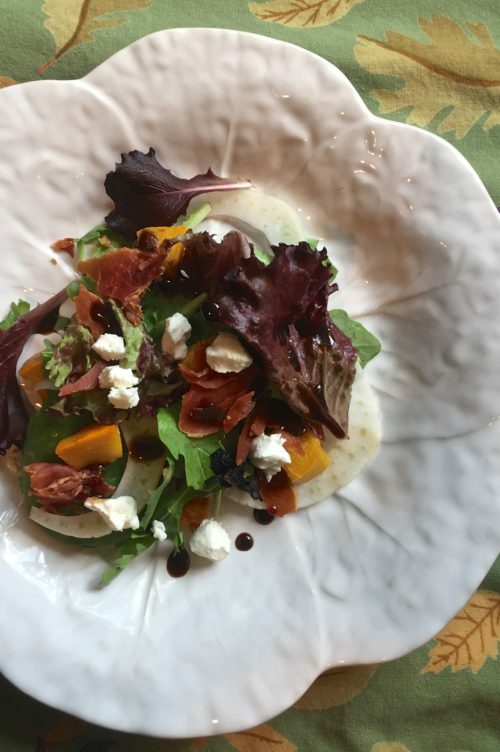 So if you can still get those little pie pumpkins, grab one and make this salad. If you can’t or don’t want to do a pumpkin recipe in December or for Christmas, substitute butternut squash for the pumpkin pieces. Hopefully you aren’t like me and only think certain things should be cooked in certain months. I really need to get that out of my head – that stuffing/dressing can only be made in November. That is the only time I make dressing. Even though I might freeze leftover dressing, it really never gets eaten because it seems to just not fit in March when I’m cleaning out my freezer and find a dish of my Thanksgiving stuffing that was so delicious back on the day smothered with giblet gravy with some mashed potatoes and saurekraut sitting beside it. Now that has my mouth watering and me wanting some dressing. Maybe I could stuff pork chops with stuffing, that doesn’t sound very Thanksgivingly but would use up that dressing you may have popped in the freezer. 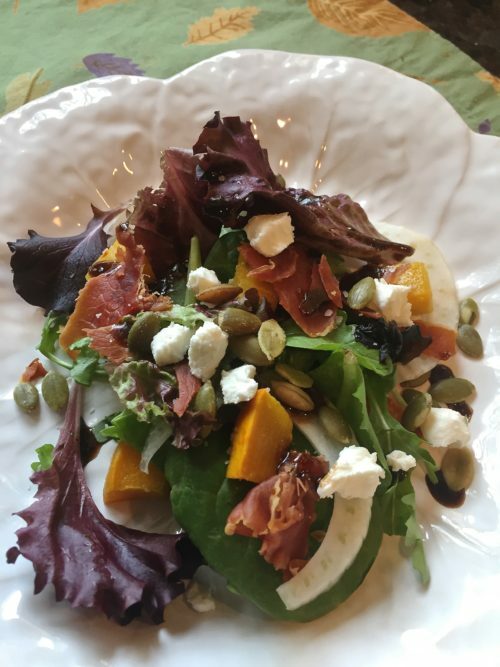 I had seen this salad on the menu at a restaurant I ate at in Savannah a couple of years ago and it stuck in my head until this year and I finally bought that little pumpkin and cut it up. 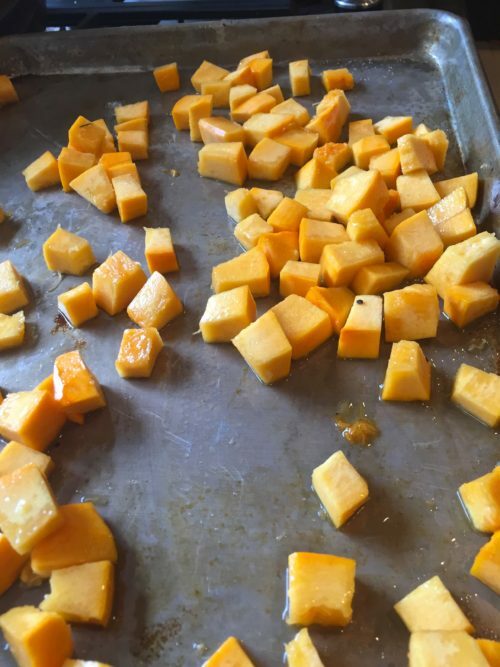 Now I’m thinking how Trader Joe’s sell butternut squash already cut in small cubes that would work perfect and I would still use the salty pumpkin seeds because I can find then any time of the year. Hope ya’ll had a great Thanksgiving and you are starting to think about all the family favorites you will be cooking in December. BLAST FROM THE PAST: Looking for some homemade item to make for a special friend or neighbor? Try my Honeycomb Shards, the are fantastic dipped in chocolate. Baked in the oven until it is crisp and then break it into shards. Roast the pumpkin (or butternut squash) until tender. Add in the thinly sliced fennel. Drizzle the salad with some of the dressing and then add the goat cheese. Add roasted pumpkin seeds and shards of prosciutto and serve. 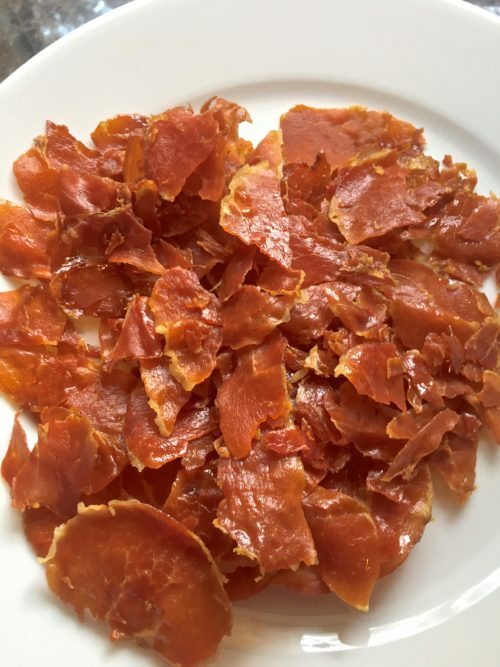 6-8 thin slices prosciutto, baked until crisp. Cut the pumpkin skin off and cut into 1" squares. Drizzle with about 2 tablespoons of olive oil, sprinkle with sea salt and roast at 400° for 30-45 minutes or until there pieces are very soft and are starting to brown on the edges. Bake prosciutto on cookie sheet at 350° until crisp. Cool, then break into pieces. 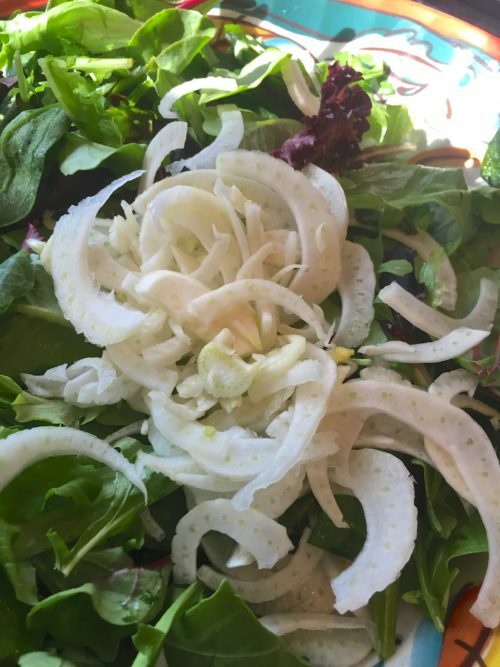 To assemble the salad, put the arugula and/or spinach in a large bowl, add the thinly sliced fennel if you want that ingredient. Add the roasted pumpkin and the shredded serrano ham. Toss gently. 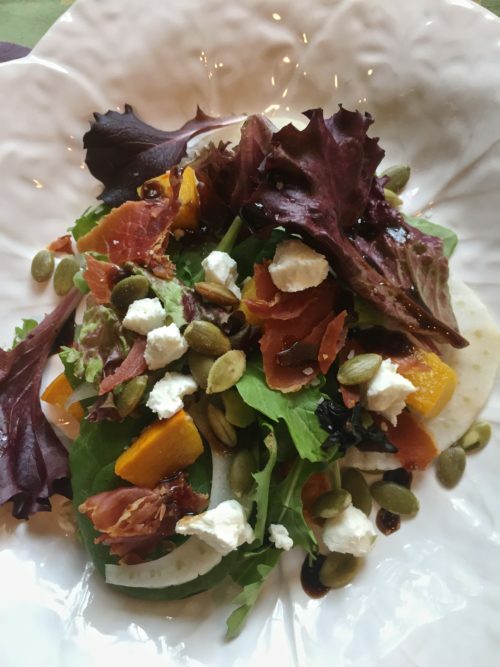 Toss the salad gently with some of the maple vinaigrette then tops with the pumpkin seeds and the goat cheese. Garnish with the fennel fronds if you have them. For the vinaigrette combine the oil, vinegar, syrup and mustard in small bowl and wish until well blended. Salt and pepper to taste. Butternut squash would be a great substitute for the pumpkin when pumpkins are out of season.